This is a book that has ventured into partially explored territory. There is no old classical work that deals with planets in houses and signs both at the same time. Some attempts have been made in recent years. The meager literature that is available does not base itself on classical information. The descriptions are also couched in language of the yore. It does not state the effects in terms of modern idiom. 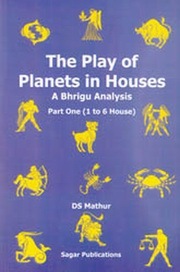 This book addresses the deficiency in a reasonably detailed manner and it is going to be a mandatory addition to all astrological literature shelves. Help us to improve our product listings by updating product information. What Do Customers Ultimately Buy After Viewing This Item? Write a review for this book! Join our Vedic Books family by subscribing to our newsletter and keeping up with divine wisdom from India. Earn 5% commission simply by linking to Vedic Books !